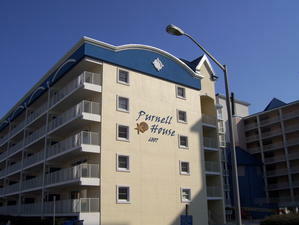 The existing Purnell House condominium built in 1981 and located on 61st street in Ocean City Maryland, was in need of renovation not only to the façade but to the windows, doors, walkways and mechanical units in order to bring this building up to current building standards. Based on our building survey, GMB also provided a face lift design for the building including a parapet and EIFS trim work to enhance the resort aesthetics that the clients requested. GMB then provided full construction documentation, bidding and construction administration services, to carry through the vision from concept to reality. The four foot custom building logo was also designed by GMB for the client which has been cut from the EIFS and rendered to match the electronic drawings.